Wooden shapes threaded on elastic band, includes bell and mirror foil print. Made of beech wood. I absolutely love these Haba baby toys. My son(s) love this little clutch toy. 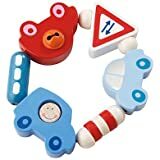 Great as a teether, entertainment, and the two year old loves to play with it too. Great quality, safe paints/woods, and overall an awesome, quiet toy! One of my favorite Haba Rattles! I’ve given this as a gift a few times and it’s been a hit. I finally got to purchase one for my son who is due this year. Haba products and customer service are great! My 9 month old baby loves this. She has enjoyed the Kringelring for awhile and I was going to order her some more Haba toys, and then we happened to find a shelf of them in a baby store and this is the one she picked out–I was going to get her the pipapo and a couple of others but she found this one way more interesting. It is really cute. She likes the bell, and the face in the blue car moves back and forth a little. It’a a very fun toy and I love that it’s totally nontoxic.